Yes! Take me to the calls. Have you introduced me to magic? This is AMAZING, BRILLIANT, INSIGHTFUL, LIFE ALTERING, and LIGHT! I am blown away by the power of this practice. I encourage anyone to spend time laughing with Anne and expect a sea of wonderful changes to follow. The moment you laugh, it does not come from your mind. It comes from the beyond, from your very inner spirit. I call this an “experiment” because we don’t know what will show up when you play in the energy of JOY, but it’s always good. Beautiful. Loving. Cleansing. Healing. Mind-blowing. Paradigm-shifting. Even phenomenal. This is the power of a daily laughter meditation practice — flushing our systems and clearing out the heaviness, tension, and mental overactivity — by flooding our minds and bodies with the energy of JOY! Choosing to step into the FLOW of JOY allows us to live from the energy of infinite possibilities, where synchronicities, magic, and miracles happen. What might be possible for you? When I start my day with laughter, everything just seems to go better all day. I feel better, and things just “click” much more smoothly. Plus it’s contagious — I smile more during the day, which makes my clients feel better, and I swear it makes me more magnetic for new clients as it just seems easier to attract them when I’ve been laughing regularly! When I first heard of intentional laughter I felt weird about what my family and friends would think if I just started laughing, but now they love it too. I’m so grateful for this practice, and really excited to join the Planet Joy Experiment and laugh with people all over the world every day! Laugh along LIVE via phone or on the web! Recording will be sent out the same day, so you can participate later at your convenience. Every day? No thanks, I’m too busy. Q: Do I have to do it every day for 5 days? A: This is about JOY, not “follow the rules or else” energies. If you find JOY in doing “5 day JOY challenges”, then YAY for participating daily! If you are just “joy-curious” and want to dabble with this intriguing practice that you intuitively know would be good for you, you can sign up and participate whenever your schedule allows, and then trust your instinct as to how often you want to participate. As you laugh, you ignite the spark of aliveness in your core. You relax into your true essence. You let down the walls of tension and anxiety in your body. You step out of the mental “stories” and limitations about what’s possible. And you ALLOW life to flow through your body, your mind, your being. Uh… so we just start laughing? That’s it? Um… weird. 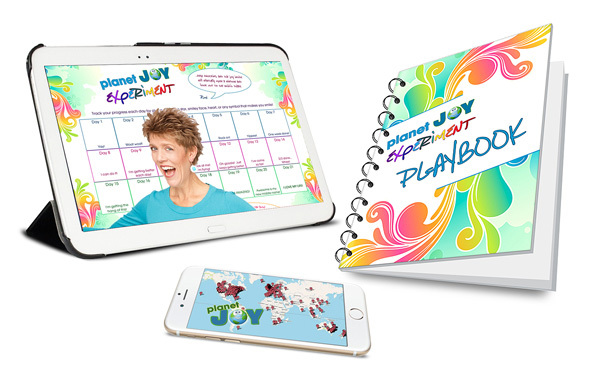 To participate in the Planet Joy Experiment and access all of the daily live laughter meditations, the playbook, and your Joy Activation Toolbox filled with goodies from the Planet Joy Lab, your investment is $21 — to activate your JOY! Where do the daily themes for the Planet Joy Experiment come from? The lightness of joy helps so much — the impossible turns out to be possible! The Planet Joy Experiment is exactly what your soul has been yearning for. Which of these fits your WHY? I want to feel JOY! Consistently. Regularly. Please. I just take everything too seriously and I’m not sure how to break the habit. I’ve got this sense that if I could just let myself be guided by the Higher Power that can see the big picture and the path that brings me the greatest joy, love, abundance, and freedom, things might flow a bit easier for me. And I could use some support with this whole “surrender” thing. Trust issues, you know. I’ve tried some intentional laughter before and it felt good, but… it didn’t really spark lightning bolts or part the seas or anything. But I know there MUST be a way to experience the “magic” of life more openly. I have a tendency to “get in my own way” and would really, really like to feel like I’m free from that pattern and all of its sidekicks: overthinking, overcomplicating, making things harder than they need to be, over-worrying, overanalyzing, and overdoing. Hey, I just think it would be FUN to be part of a larger movement of people who are changing their lives and our world by making joy a priority! I’ve been wanting to share joy with others, and this gives me a way to begin! Or… maybe you just want rock hard abs? Plus, the daily recording will be sent with a short mojo-boosting email to keep you feeling inspired, connected, and in the game! Give yourself the gift of joy ! Joy Power Activation Guide: Your short n’ sweet guide to harnessing the power of focus and clarity to unleash your authentic joy during our experiment. Laughter brings some energy from your inner source to your surface. Energy starts flowing, follows laughter like a shadow. When you really laugh, for those few moments you are in a deep meditative state. If you are possessed by laughter, thinking stops. And if you know a few moments of no-mind, those glimpses will promise you many more rewards that are going to come. If you can laugh early in the morning you will laugh the whole day. You have created a chain effect; one thing leads to another. Laughter leads to more laughter. If you become silent after your laughter, one day you will hear God also laughing, you will hear the whole existence laughing — trees and stones and stars with you. Laughing with others consistently, repeatedly, and frequently, is a practice that has transformed my life. What might be possible if you invite others to join you for the Planet Joy Experiment? Solo: You’ll register for the Planet Joy Experiment, participate in the live calls/webcasts from the comfort of your home or listen to the recordings at your convenience, and participate in the online Facebook group as much (or as little) as you desire. You’ll receive the daily emails and the Planet Joy Experiment Playbook and you’ll hold yourself accountable to join the live calls/webcasts or listen to the recordings at a time that feels most joyful for you. you just think it would be FUN to have a Joy Buddy to laugh and share your daily intentions and insights with! You can invite your Joy Buddy to participate for no additional charge. For example, your best friend, your spouse, or even your entire family can participate with you for a single investment of $21! You’ll receive the emails, the Playbook, and the .mp3 recordings to share with your Joy Buddy. Start a Joy Squad! If you’d like to share the gift of joy with others, you can register for the Planet Joy Experiment, access all of the materials and recordings, and then share them with groups that you gather for the purpose of leading a Joy Experiment in your community.Whether you’re already in a helping profession or you’re new to facilitating groups, you can start a Joy Squad and invite others to laugh together — using the playbook and the .mp3 recordings — and see what happens for you and others in your life! Your clients, your church group, your book club, your mastermind group — everyone can benefit from a daily dose of joy, and you’ll gain immense joy from sharing the gift of joy with others! Your entire group can participate for a single investment of $21 — the more the merrier! Hi, I’m Anne Timpany, Creator of Planet Joy. I started the practice of intentional laughter in 2010 (during a very stressful period of my life in which LIFE WAS NOT FUNNY and laughing for the sake of laughing seemed like a bizarre practice suited for crazy people, certainly not ME). After 3 weeks of laughing, I had the breakthrough that changed my life: I connected with a vision of what was possible for me if I kept laughing. I saw myself laughing with people around the world, traveling and leading joy retreats, and being a transformational leader — contributing to the shift in consciousness that humanity is experiencing right now. Laughing pierced the veil and showed me with clarity what my life’s work would be. It also awakened an ALIVENESS within me that gave me the courage and confidence to step out on the wings of trust and laughter and begin to co-create a truly extraordinary life. Since then I’ve laughed with thousands of people and my mission to share joy with people has taken me all over the U.S., on a Caribbean cruise, to Maui, England, Europe, Thailand (twice! ), Australia, Mexico, and most recently, allowed me to fulfill a lifelong dream of chartering a sailboat in the Greek Isles for a family vacation. Six years ago if someone had told me this would be my life, I’d have insisted that they were getting me mixed up with someone else. Laughter has helped me stay joyful through divorce, single parenting and co-parenting challenges, financial stress, and the wild and crazy ride that is entrepreneurship. It’s been a lifeline on my spiritual path as I’ve waded through the layers of guilt, unworthiness, self-doubt, shame, fear, and uncertainty – giving me a tool to cleanse my cells of stress hormones, clear my energy field from the residue of heaviness and shadow, and stay connected with my higher self through it all. Laughing with intention has been key to attracting my soulmate partner, manifesting a dream house, crafting a creative, fun, and successful business doing exactly what I love, and making soul-nourishing connections with uplifting and inspiring friends around the world. Over the last five years, I’ve been leading laughter meditations wherever I go — events in which people gather to laugh together for anywhere from five minutes to an hour, followed by stillness. This has turned out to be one of the “power practices” that has shaped my life and the lives of the participants — not so much of what it DOES but because of what it ALLOWS. Participants have experienced spontaneous reframing of stressful challenges and problems into hilarious “cosmic joke” stories that they can’t believe they were ever worried about, they’ve had powerful spiritual insights and visions appear, they’ve alleviated physical health symptoms that had bothered them for ages, and consistently feel a total relaxation and a knowing that “all is well” from a deep wellspring of truth and peace. Participants regularly report things like a feeling of ease and ability to laugh more readily and freely during the day, taking themselves less seriously, not getting so stressed out about things that used to bother them, and feeling more relaxed about life in general. Those who have adopted laughter as a practice have experienced fun synchronicities and delightful manifestations — evidence that when we decide to ENJOY OUR LIFE more, life gives us MORE TO ENJOY! When we laugh together, we create a powerful energy vortex that amplifies our intentions, strengthens our connection with the co-creative power of the Universe, and helps us to trust ourselves and trust life just a little bit more than we did yesterday. It’s so ridiculously simple, we tend to overlook the secret that’s hiding in plain sight: we’re wired to embody JOY, and in so doing, we make our lives much, much, much easier, happier, and simpler. I’d love to have you join me for the Planet Joy Experiment. I can’t say what will happen for you, but I know this: It’s going to be good. And you’ll feel good. And you’ll wonder why you haven’t been doing this all along. Simple. Easy. Fun. See you inside! Click below to save your spot in the Planet Joy Experiment, invite your friends, and I’ll laugh with you soon. Let’s rock this planet with JOY! …keep knocking, and the joy inside will eventually open a window and look out to see who’s there. I think that what we’re all seeking is an experience of being alive, so that our life experiences on the purely physical plane will have resonances with our own innermost being and reality, so that we actually feel the rapture of being alive. Laughter is life, is love, is light. Laughter in its purest form is a dance of all your energies. Can daily laughter add magic to your marriage? How is the Planet Joy Experiment different from laughter meditation in person? What an awesome experience. It’s felt so magical and so alive to me. More than anything, it’s reinforcing everything I’m being guided to about the truth of who I am and the power I possess at my deepest core. I’ve realized how much freer and happier I would be if I would just let go, trust and know that I will be taken care of as long as I’m living what I’m led to do AND I will be bringing such a gift to the world by living authentically. I’ve realized how many of us pinch off our own life force by not living and being the I AM that we innately are and are called forth to express. I experienced a taste or feeling of the freedom that I would have if I would just let go of the fear and the struggle. What I realized is that God would not instill this gift within my heart if he/she wouldn’t also take care of me while I am touching and uplifting millions of lives with my message. My back was straighter today then it has been for a long time which translates in my mind as a mental alignment/shift showing itself in the physical as well. Stuff is definitely being stirred up AND I can also see the good in all of the situations. I loved taking this time to nurture my soul, really contemplate the questions and tune in to the message offered. So much came to me during and after every call. Did anyone ever mention how deep this stuff is getting? ha, ha, ha! I so enjoyed laughing with others and hearing others’ laughter! I am feeling joy and feeling committed to have a joyful life. It feels possible now. I loved it all and am so appreciate the time and thought that went into creating this experiment. It was very professional yet gloriously fun! I loved that we were able to set ourselves up for success before we even started. I had doubts about finding the time or getting up early, but this program has helped immensely with both issues– time seems to just pop out of nowhere. Finding our true Why was a big deal as it helped me focus on what I really needed to focus on. My anxiety is less and it’s easier for me to go places and do things, and I loved the magic that we explored, finding magic in every day life! The Planet Joy Experiment is an easy, fun, affordable and a gentle natural way to shift your daily energy! I just feel happier and lighter… My energy has been looser, more free and allowing. I had some great laughing experiences with other people due to my energy; they knew nothing about this experiment, I just carried this fun energy with me! I feel better and I can really sense the possibilities for healing and health in conscious laughter . A lot of nice things came my way, food, meals out, people dropping by, “finds” out shopping…and I just feel lighter! I decided to participate because I was feeling a little burned out with my life. I knew I needed to release a lot of blocked energy and laughter is such a great way to do that. But laughing for 10 minutes/day for 21 days straight?! There HAD to be something powerful to come out of that! Now after doing this Planet Joy Experiment I play with my husband a lot more by taking life, conversations, and tough adult decisions WAY less seriously. He’s noticed a difference in how light-hearted I’ve become in the last week. And personally, I feel so free and light. The energy blocks that I’d experienced before have definitely allowed space to invite in a new way of being and living. I loved all the love I felt while laughing and the energy shifts! It may sound weird to laugh for no reason at all, but really, you just have to try it before you knock it. This stuff WORKS! From joy springs this universe; in joy it has it’s being, and unto joy it returns.